noodlegarage is a food blog exploring Asian diaspora cooking. Mauritian Chicken Curry is one of those dishes that take me back to my childhood. Every Sunday back in the '90s in North Carolina, we would go to my grandmother's apartment for the afternoon and this dish was always on the menu. My grandmother (and mother) was born in Mauritius, but at a time when the Hakka Chinese community was still quite insular, still practiced traditional Chinese customs and didn't integrate with other ethnic communities—my mother would change that, thank god. Back in the day, my great grandmother even made her own rice wine... I'll have to research that Chinese moonshine recipe one of these days. Anyways... back to the food. Mauritian curry tends to be lighter in flavour than Indian curry and has a stronger hint of cumin. It's also more brothy. In many ways, it's like a mix between Indian and Caribbean curry. You can buy pre-mixed bags of Mauritian curry, however, I prefer to use my cheat recipe, which my friend Sheik, a native from the island, tells me tastes like the real thing. Next challenge: making Mauritian Curry powder from complete scratch. Stay tuned. Cut the chicken into bite sized pieces (leave the bone on for more flavour, remove bones if your guests are Guai Lou and get scared by bones). Salt and Pepper the chicken and set aside for about 30 min. Pour in 1/2 cup of water and mix together to form a nice paste. Chop and mince the onion, garlic, ginger and red chilli peppers (remove the seeds and the light areas in the pit). Combine the red chilli peppers and the garlic in a mortar and pestle and grind into a chunky paste. Combine this mixture in a bowl or plate. Heat about 5 tablespoons of vegetable oil in your large pot. Fry the chicken pieces on medium high heat in a pot until the skin side is light brown. 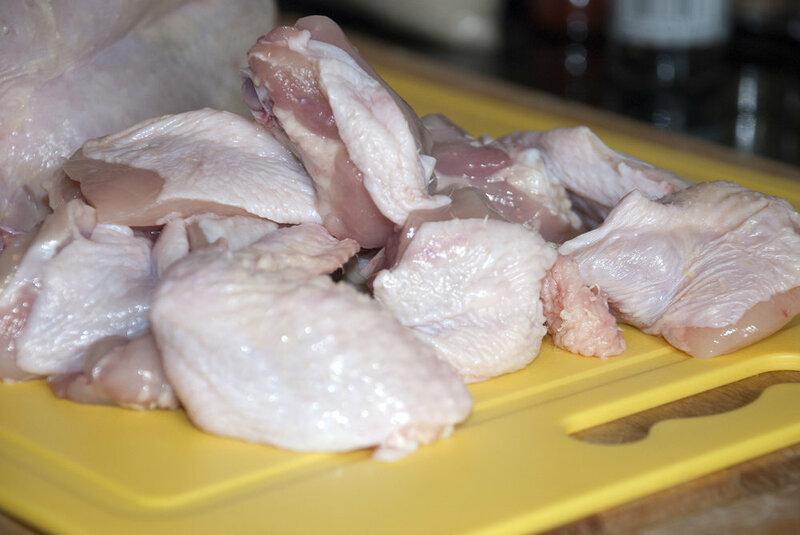 Remove chicken pieces, set aside. Add the chopped onions to the pot and fry on medium heat until the onions become translucent, stirring it around the whole while. 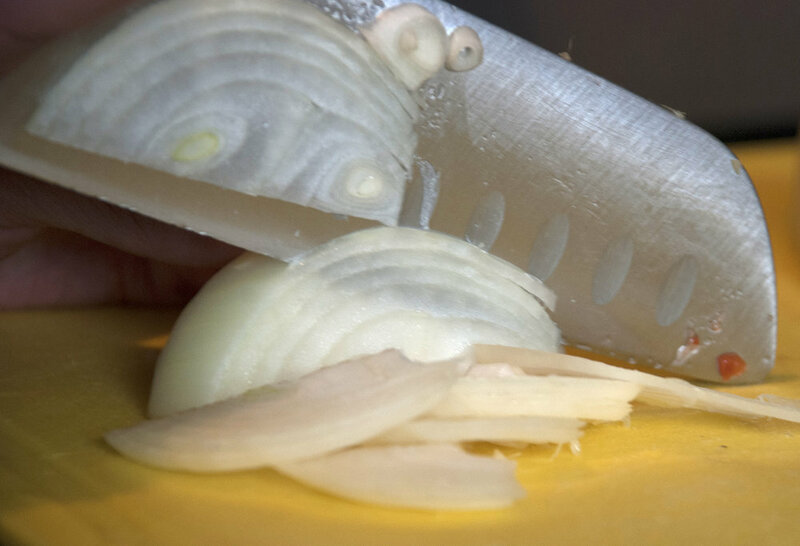 Add 2 tablespoons of white wine to soften the onions. Then add the ginger, garlic, and red chillis. Add the curry paste to the pot and continue to fry and stir for about 4 minutes. Add alittle water, if the mixture seems to be getting too dry. Add the chicken and fry and stir for about 5 minutes. The chicken should be coated in the curry. 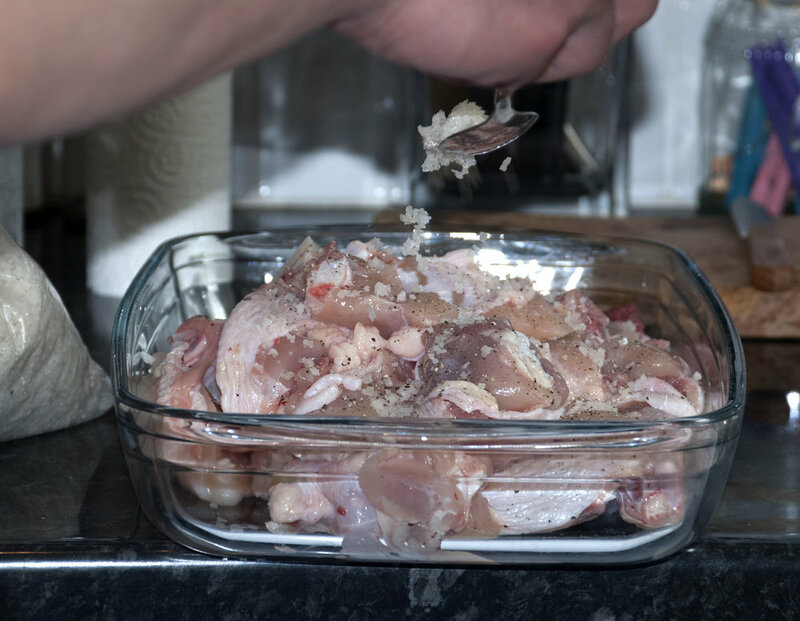 Add about 1.5 cups of water so that the chicken isn't full submerged in the water, but the water reaches about half an inch below the top of the chicken. Cover and simmer on medium/low heat for 10 minutes. Throw the chopped coriander on top before serving. Serve on Jasmine rice. Mix the paste together: add the powders and add enough water and mix to make a thick paste. Chop and mince the onion, garlic, ginger and red chilli peppers. Combine this mixture in a bowl or plate. Add the Number 3 (onion, garlic, etc...) mixture to the pot and fry on medium heat until the onions become translucent, stirring it around the whole while. Add the white wine to soften the onions. I'm a digital designer and aspiring chef. When I'm not designing or cooking, I'm usually playing volleyball, looking at art or socialising.